During my travels, I have had the opportunity to experience many different types of food. While living in the UP of Michigan, I became friends with a wonderful woman from Pakistan, named Aisha. She was happy to share her culture with me. We would take trips to Milwaukee so she could obtain Halal food items to cook for her family and fortunately for me. I was introduced to wonders of Halal Pakistani cuisine. When I looked at the list of food trucks that would be at the Holly Springs Food Truck rodeo, I was both surprised and pleased. I knew immediately I wanted to sample and review the Halal Brothers Food Truck and took the lead on deciding what we should order. I could not access the Halal menu from their website so I emailed and received the items which would be served. 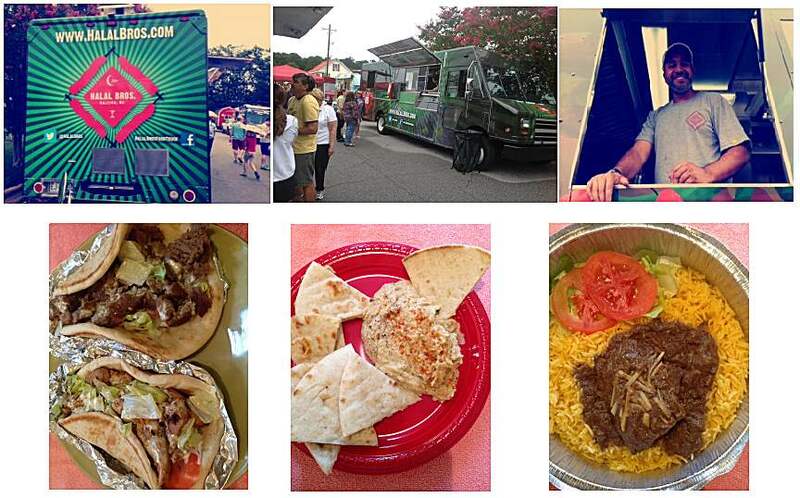 The truck is operated by, Sameer Cheema, Nabeel Cheema and Dominick Stellato, who have relocated to the Raleigh area from Woodstock New York. I selected Nihari. Nihari is a Pakistani stew consisting of slow cooked beef or lamb garnished to taste and served with rice and naan. The word Nihar originated from the Arabic word “Nahar” which means “morning” after sunrise Fajr prayers. This dish was usually eaten in the early morning. Halal’s beef stew was fork tender and very flavorful. It was served with rice, lettuce and tomato. The menu stated it was garnished with ginger, jalapenos and ginger, but I did not find those items in our dish. Never the less it was a great dish, that I will be asking my friend Aisha to share her recipe with me to make at home. The second dish was going to be Biryani, but regretfully it was not available. This is a delicious Pakistani/Indian rice dish, which is often reserved for very special occasions such as weddings, parties, or holidays such as Ramadan. It has a lengthy preparation, but the work is definitely worth it. Our next selection was a Seekh kabob made with beef and lamb, served with lettuce, rice tomatoes, pita and sauce. A Seekh kabob is a Pakistani and Indian dish, somewhat similar to a shish kebob, which consist of ground meat and spices pressed on to a skewer and cooked on charcoal stove. These kebabs are traditionally cooked using a tandoor, which is a type of oven popular throughout Pakistan, India and the Middle East. There are other types of ovens and grills can work just as well. I found the Seekh kabob to be tough and slightly dry. I prefer the kabob made with lamb, they are more tender and flavorful. I prefer a heavier hand on the traditional spices, but I will give the chefs the benefit of the doubt assuming they have been modified for the North Carolina palate. The Falafel was not available so was given Baingan which is a unique yet tasty way of making eggplants and Saag. Saag can be made from spinach, mustard leaves, finely chopped broccoli, or other greens along with added spices. The dishes tasted very good. The only suggestion I would make, would be to use some type of garnish to make the dish more aesthetically pleasing to the eye. A majority of the North Carolinians who attend food truck rodeos are not familiar with the dish. The Bad Boy and the Belle wanted to sample the beef gyro, the Tawa chicken sandwich and Hummus. The beef gyro needed more sauce. It was an average gyro to my palate. I did not care for the Tawa chicken sandwich. I felt both sandwiches needed more seasoning. Tawa Chicken is a spicy and succulent quick fix boneless chicken dish that can be prepared in just minutes. Tawa stands for flat-pan or a saucepan. So the literal translation of the name is saucepan chicken. It goes beautifully with fries or potato wedges and some sauce/ketchup or a dip, but can also be served with a simple salad for a healthier twist. This chicken can also be shredded and used as a sandwich filler or a pizza topping. I would suggest adding the salad to their menu. I would also like to see other types of kabobs and roti. The Hummus was average, once again lacking in seasoning and slightly thick in texture. It was just okay. Admittedly, this was my first experience with Halal Pakistani cuisine. I knew beforehand that because of similar spice pallets I had been introduced to, I would find it enjoyable. It could be argued I am always up for a challenge when it comes to cuisine. Reading through the menu, I was both confused, as well as intimidated by what I was getting into. Once I saw the food, I realized there was little about it that was unfamiliar. The Nihari, a Pakistani stew consisting of slow cooked beef or lamb, reminded me immediately of one of my favorite Cuban dishes, Ropa Vieja, with a similar spice flavoring. I found this dish delightful, and would feel comfortable recommending it to someone familiar with Cuban style food. The Seekh kabob, which is made with beef and lamb, as in the above dish, resembles more a sausage, than what those of us familiar with kabobs would expect. Though the meat seemed dry, I found it flavorful and distinctive to anything I have had before. I will look forward to sampling Seekh kabob again soon. The Tawa Chicken, served like a gyro, was one of my favorites. The chunky styled, hearty seasoned chicken went well with a pita wrap, along with a creamy sauce, lettuce and tomato. It was very satisfying, especially if you are a fan of gyros, as I am. The beef gyro was typical of most gyros, except the meat was spicier and chunky, instead of sliced. The gyro is a very popular food found among food trucks. I suggest you try the beef gyro from Halal Brothers for a culinary comparison. You will not be disappointed. The Baingan, a spicy stewed eggplant was surprisingly tasty. The Saag was not unlike collard or other greens that are popular among residents in North Carolina. I found these a little too mushy for my taste. The Hummus was uneventful, which is how I feel about Hummus in general anyways. One of the things that surprised me about the Halal Brothers food truck was the size of it. The thing is huge! The size allows them to provide one of the most diversified menus among other food trucks I have seen. Please take an opportunity to widen your own culinary horizons by visiting Halal Brothers food truck and sampling one or more of the unique fares they offer – I recommend the Nihari. Stay hungry my friends…Bad Boy. I am familiar with gyros and humus from the Halal Bros Food Truck but I had no idea about other choices available on their menu. I was glad The Traveler made the selections for my introduction to Pakistani cuisine. Nihari and Tawa Chicken were my favorite choices from Halal Bros. The Nihari was served over yellow rice. The meat was very tender and had a pleasant blend of spices that made it very flavorful. The Tawa chicken was spicy and juicy and served as a gyro. Seekh kabob was a combination of beef and lamb flavored with nice spices that I wasn’t used to but liked. Like The Traveler, the kabobs were on the dry side. The beef gyro and humus were average. I feel a little more sauce on both the Tawa chicken and beef gyro would have made them tastier. Since you eat with your eyes first, imagine my surprise when I tasted the unappealing, mush looking Baingan. It had a unique flavor and was very good. Overall, I really enjoyed our choices from the Halal Bros. Food Truck. This food made me feel like I was once again living in Michigan. I liked the beef gyro and the Seekh kabob. They were very tasty. I loved the stewed beef and nearly managed to eat it all before Jack ran me off. I did not bother trying the chicken, humus or vegetables. Jack does not know it, but he is scheduled for neutering on September 4. Hehehe! I ate everything, but did not really care for the eggplant, spinach or hummus. I loved the chicken, beef and the kabob. I ate part of Bobs. I am a growing boy and need lots of food. Bob is old, fat and grumpy. I think Mom likes me best.